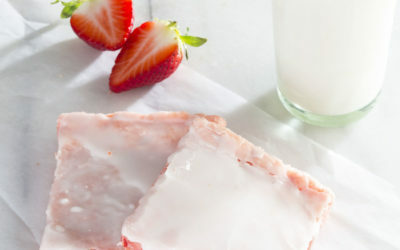 This listerine vinegar sugar scrub for feet is a DIY foot scrub that you can use every day for a therapeutic exfoliation and a pampering and cooling spa treatment. 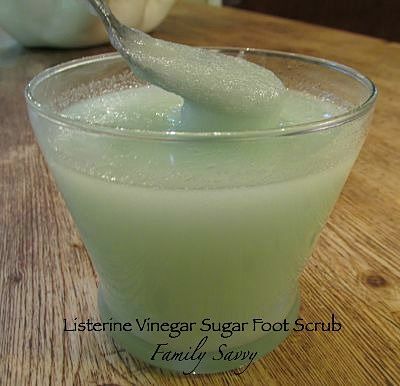 I absolutely love this listerine vinegar sugar scrub for feet! It costs pennies to make with ingredients that I keep on hand, and it feels so fab and refreshing when massaged onto feet and legs. It is also a good scrub for elbows, knees, and other areas that are prone to dryness. 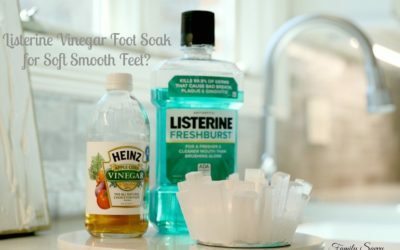 In one of my previous posts, Listerine Vinegar Foot Soak for Soft, Smooth Feet: Help or Hype?, Dr. Jo Herzog discussed some beneficial properties of listerine and vinegar. Thymol (in Listerine) can kill bacteria and fungi, and acetic acid (in vinegar) has antibacterial properties, can soften dry skin, and can possibly eliminate mild athlete’s foot. When I pamper my feet at home or give myself a pedicure, I start with the listerine vinegar foot soak and follow with the scrub. It is cool, tingly, and so refreshing. I keep a jar of the scrub in the shower and try to use it several times a week. The more often I use it, the softer my feet stay. For a double dose of cool and tingle, I add Peppermint Oil to this scrub. Adding just a few drops can increase the “wow” factor of this scrub significantly. It will leave feet icy cool and smelling and feeling great. This scrub makes a lovely hostess or bread and butter gift, especially if creatively presented. I think a glass bowl with a honey dipper is a great idea. To be really creative, it could be put into a real honeypot like this one. #whosayshoneypotsareonlyforhoney? How cute would that be? So there you have it~my fave, DIY for pennies, pampering, exhilarating listerine vinegar sugar scrub for feet! I hope you’ll give it a try; it really keeps feet soft if used regularly. I’d love to hear back from you if you try this or have any of your own savvy scrub suggestions to share! As always, thanks so much for stopping by. Be blessed, and stay savvy!!! Pour sugar into small glass container. Mix vinegar and listerine in small bowl; stir well. Pour vinegar and listerine over sugar; stir until combined. Add coconut oil and peppermint oil if desired. Add more sugar if needed to reach desired consistency. CJ, thanks for sharing this detailed description of your foot soak! Sounds like you have it worked out to a science:-) Thanks so much for sharing this with the rest of us!!! Hi Robin! I’ve soaked in this with little cracks on my feet and did fine, but you may need to try it out for yourself first. I’d hate to tell you it won’t hurt and then you have a bad experience:-) Let me know; I hope it works for you! What if you’re feet are cracked? Hi Dana, I have never tried honey, but it sounds wonderful! I’ve seen many scrubs with honey in them, so I’m sure it is a beneficial ingredient. Let me know how it turns out! I’m trying this right now…I am PRAYING that it’s as awesome as it claims to be!! Hi there! 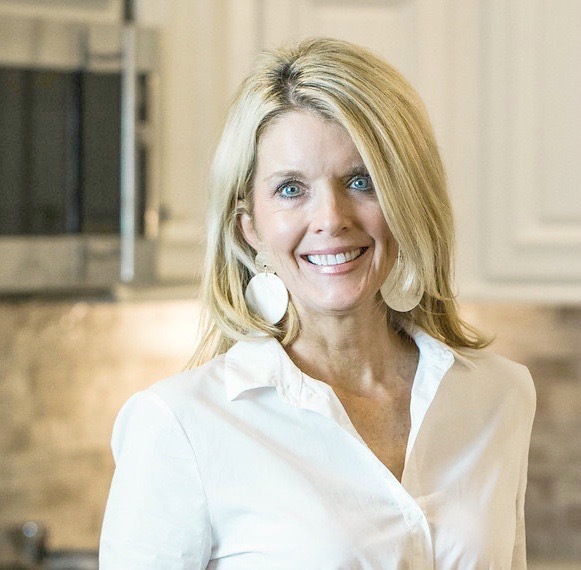 If you search under the “health” tab on the blog, Dr. Herzog wrote an article on “smelly feet.” Check it out! Thanks for reading! Andrew, so glad the soak worked for you!!! 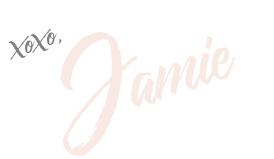 Thanks for reading the blog!!! 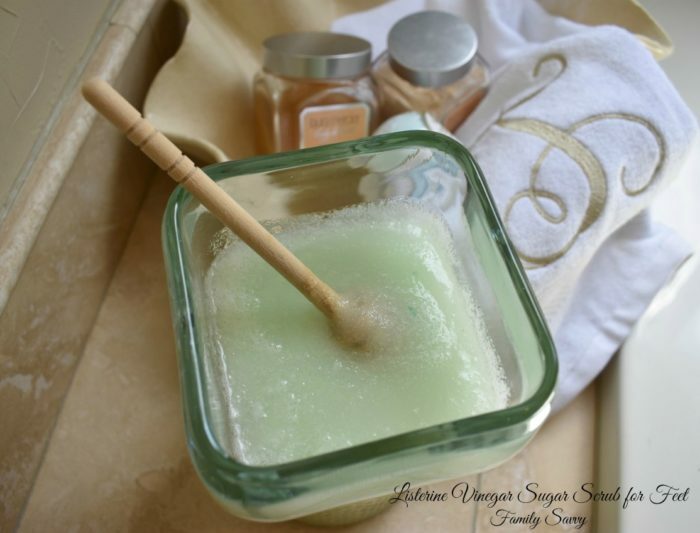 I just finished using your ‘Listerine Vinegar Sugar Scrub’ recipe; and my feet are so soft! Thank you for your work on this. Can I use Epsom Salt instead of sugar? Darn it. I am sitting in my bathroom right this minute doing the poor mans soak. The listerine, vinegar and water. Good idea though as I have bad calluses so I am having some trouble being able to run. I will keep yours beside the tub for now on but will keep a lid on it as it can be a bit smelly. Sara, thanks for sharing your thoughts. I love this scrub and think it really does make a huge difference! Love this! I just tried it (I only had the original listerine) and it worked great! My hands and feet are so smooth! Going to recommend this to everyone now. Hi Nancy! I keep a glass jar of this on my garden tub with a spoon in it (there is no lid or cover). It is fine, but just needs an occasional stirring to loosen any hardened sugar crystals. You can find glass jars with lids at Hobby Lobby, but mine without a lid works fine! Ca I store the left overs and use them again? If so, how?